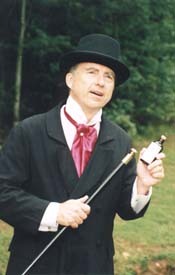 "Dr. Bob" Grove pitches his miraculous nostrum "Aqua Pura" to a delighted audience during his popular medicine show.
" Ladies and gentlemen, it is my privilege to bring to you the medical wonder not only of our ages, but of ages past, Dr. Bob's Aqua Pura, containing a natural preparation used around the world for treatment of pains, sprains and strains, itches and twitches, congestion and indigestion, chills and other ills, colic and catarrh, constipation and flatulation, irritation and inflammation, sneezes and wheezes, dropsy, dyspepsia and diarrhea, female weakness, and men's secret diseases." In 1796, the first U.S. patent for a medical device of dubious distinction was issued to Dr. Elisha Perkins for his Metallic Tractors, a set of metal prods attached to a Galvanic cell (battery). It was and, in some circles, still is, commonly believed that good health is equilibrium of magnetic and electrical charges. Throughout the nineteenth and twentieth centuries, magnets and electrical devices have been applied to the ailing body in an effort to "restore" this balance. Even before that time, useless pills, salves, and liquid nostrums were widely hawked by pitchmen who extolled their mythical virtues. During the unprincipled years of the late 19th century, colorful compounds--bitters, elixirs, vermifuges, pectorals, alternatives, balms, ambrocations--and imaginative devices were advertised everywhere--magazines, newspapers, mail order catalogs, store fronts, fence posts and barn roofs. The Sears Roebuck catalog was a cornucopia of concoctions and contraptions. Hundreds of traveling medicine shows extolled the virtues of worthless preparations and products: There were Dr. Kilmer's Swamp Root, Dr. Pierce's Golden Medical Discovery, Dr. Pierce's Nasal Douche, Kickapoo Indian Sagwa, Sarsaparilla, Dr. Hercules Sanche's Oxydonor, Balm of Gilead, Rattlesnake Oil, Pulvermacher's Electro-Galvanic Chain, Kidney Pads, Anodyne Cordials, magnetic plasters, Pink Pills for Pale People, King of Pain, Lithontriptic, Thayer's Slippery Elm Lozenges, Men's Secret, Swamp Oil, Galvanic Love Powder, The Invalid's Friend and Hope, Princess Lotus Blossom's Vital Sparks ("from the Quali Quah pouch of the Kup Ki See Chinese Turtle"), Kurakoff, Wilsonia Magnetic Garments, Dr. Fahnstock's Celebrated Vermifuge, and countless more. The golden age of quackery took advantage of a receptive, unsophisticated public, awed by a barrage of legitimate discoveries by scientific luminaries like Edison, Bell, Marconi, Curie, Becquerel, and Tesla. During the first two decades of the twentieth century, a number of radium cures were unleashed on a credulous public unaware that, and Madame Curie's fingers had fallen off before her death. This radioactive patent medicine period ended about 1930 when steel magnate Eben MacBurney Byers, who boasted he had drunk 1400 bottles of radium water in two years, died after his jaw fell off. The vast majority of patent medicines were alcohol-based, many containing opium or morphine as well. Virtually none contained the ingredients they claimed to have, and none could heal. Vital Sparks, promising to revitalize masculine virility, was made by rolling rock candy in powdered aloe. Tiger Fat, a cure-all balm touted to be rendered from Royal Bengal tigers' backbones, was concocted of Vaseline, camphor, menthol, eucalyptus oil, turpentine, wintergreen oil, and paraffin. Liver pads, promoted as cure for liver diseases, were nothing more than small fabric swatches with a spot of red pepper and glue; when the body heat melted the glue, the sting of the red pepper was perceived as a healing sensation. During this period of medical chicanery, anyone with a charisma and a horse could travel from town to town hawking his nostrums. The pitchmen had a caste system: The "high pitch" salesmen were elevated on a stage or wagon, while the "low pitch" salesmen worked the streets from a suitcase ("med case" or "keister") set on a portable tripod or table which they were expected to fold up while the high pitch men were in town. The nostrum peddlers commonly represented themselves as Quakers, Orientals or Indians, appearing in hundreds of traveling pageants assembled after the Civil War. The largest medicine shows were assembled by John E. "Doc" Healy and Charles H. "Texas Charlie" Bigelow in 1881; their 20 road shows stopped at towns across rural America to offer hours of entertainment--singing, dancing, trained animals, minstrel shows, movies, chalk talks, skits ("afterpieces")--all for a dime. Smaller road shows were free. The Healy and Bigelow program was interrupted four to six times by the pitchman who would extol the virtues of nostrums from the Kickapoo Indian Medicine Company; a shill in the audience would buy a dollar bottle, sample it and proclaim himself cured, demanding another bottle. Floor salesmen (usually performers doing double duty) would carry only one or two bottles so that they could frequently holler, "All sold out, Doctor!" to feign frenzied buying, then rush to the stage for more provisions. If the successful entertainment-interrupted-by-a-commercial format sounds familiar, it should; it was adopted later, and is still used, by radio and television programs! These colorful characters had a language of their own, using a ballyhoo (gimmick) to sell "slum" (liquid medicine), "grease" (salve), "chopped grass" (herbs), and "flea powder" (powdered herbs). They often associated with "pennyweighters" (diamond thieves), "moll buzzers" (purse snatchers) and "clock men" (watch thieves), and employed "shills" (confederates) to "steer" (hustle) and "squeeze" (defraud) their "yokels" (suckers)! High noon for the nostrum peddlers came on January 1st, 1907, with the passage into law of the 1906 Federal Pure Food and Drug Act, largely forced by the efforts of one tireless journalist, a reporter named Samuel Hopkins Adams, whose scathing Collier?s Weekly series, "The Great American Fraud," (Oct. 7, 1905-Sept. 22, 1906) exposed 264 fraudulent firms and hucksters. After this expose¢ , the federal government required these purveyors of potions to list the ingredients on their labels. It was not quackdom's finest hour--it was their final hour. The illegitimate empire began to crumble. But patent medicines were far from extinct. Even after the passage of the 1906 Act, the FDA gave food adulteration a higher enforcement priority than quack medicine; no jail sentences were imposed; the small fines, typically $10-$50, were a minor business expense; nostrum peddlers merely changed labels for appearances, then claimed that their concoctions were endorsed by the FDA. During the next few decades, however, automobiles, better roads, movie houses, radio and, later, television, all provided alternative sources of entertainment to the old-time medicine shows. By the 1950s fewer than 10 road shows were left, and they were gone by the '60s when the last bottle of Hadacol was sold. Few perpetrators really believed in their products; the overwhelming majority were then, as they are now, unconscionable charlatans. Legitimate physicians derided this "gas pipe and wire" therapy, referring to the early "Oxydonor" contraptions made literally from gas pipe wired to the body. Government regulation of medical gadgetry began in earnest in 1938 with the passage of the Federal Food, Drug, and Cosmetic Act. Further restrictions were levied by the Medical Device Amendments of 1976 and the Safe Medical Devices Act of 1990. But gadget hucksterism continues to this day, with many individuals testifying to the miraculous healing they receive from devices, persons, icons, chemicals, and foods. The late actor Steve McQueen believed coffee enemas would cure his cancer; Peter Sellers engaged "psychic surgeons" in the Philippines, finally resorting to legitimate physicians--too late. Americans are being bilked an estimated $25 billion a year by health scams. Gadgeteers often capitalize on high tech fears like electromagnetic fields from power lines, cellular phones, and appliances. Consider these ads from a recent holistic magazine: A small amulet claims to balance, support, and protect you from invisible energy drains, while a diode purports to hold you in electrical balance; naturally, both claim to be used by doctors. For $39 plus shipping you can zap yourself for instant pain relief, but you can buy the same device--a barbecue grill spark igniter--for under $10 at Wal-Mart. For a mere $8 you can purchase a shower curtain clip that assimilates your thought-sensitive energy field and stimulates your mind, soul, and spirit. Send your photograph and $45 for a remote healing treatment--three treatments recommended! And on and on. As W.C. Fields' screen character wryly amended P.T. Barnum's famous quote, "There may be a sucker born every minute, but every ten minutes there's somebody born who'll take advantage of those suckers!" (4) And if he dies, the therapy was not started soon enough. So when is the treatment quackery? According to the FDA, if it is worthless or dangerous. For example, while Davis and Kidder's "Magneto Electric Machine" was promoted as a treatment for nervous disorders, the patient (victim?) was probably a lot more nervous after getting zapped! In any case, these devices didn't live up to their claims. No singular treatment (panacea or nostrum) is effective against a wide range of afflictions. Massagers, external suction devices, saunas and sweat devices, and other gadgets and creams cannot take off weight or fat without dieting or exercise. Vibrators cannot cure arthritis, rheumatism, nervous disorders, heart conditions, or other serious diseases. Breast enlargers don't work; in fact, they can cause the spreading of cancer cells if present. Home air purifiers, vacuum cleaners, and negative ion generators cannot prevent or treat allergies, colds, or other diseases. "Secret" treatments are fakes. Product endorsements are meaningless. Be wary of promotional hype like "100% guaranteed...amazing breakthrough...miraculous cure...natural and non-toxic," or available from only one doctor, foundation, clinic, or another country. If you have a question about a medical device, treatment, or compound, contact your nearest FDA office. If you wish to report a suspect device or remedy, send complete information to the Office of Compliance, Food and Drug Administration, 2098 Gaither Rd., Rockville, MD 20850. .. and miscellaneous devices of questionable therapeutic value which glow, buzz, blink, or shock in an attempt to impress the patient. Most commonly found today are the wood-encased Faradic batteries from roughly 1880-1910, and the violet ray devices of the 1920s and 30s (and still being sold by mail order). Quack medical collections are few and far between. There is no organized collecting society, and cooperative informational exchange is limited. To make things even more difficult, many copycat devices were on the market and, just as with patent medicines, one manufacturer might private-label devices for a variety of companies. The most productive sources of quack medical devices, in descending order, are: antique radio and amateur radio swap meets, antique shops, flea markets, yard sales, estate sales, and auctions. Publications from antique radio societies often carry classified ads from collectors. Some limited marketing is conducted on the Internet. Electrode: The conductive attachment to the patient; may be a metal prod, cylinder, plate, soaked cotton, or glass tube. Faradic battery: An electrotherapy device built around an induction coil. Faradic current: The rough alternating current produced by an induction coil. Galvanic current: The direct current produced by dissimilar conductors in a chemical electrolyte, as in a cell or battery. Induction coil: A high-voltage-output transformer utilizing a spark-contact interrupter in its primary winding to produce pulsating current from a battery. The heart of the Faradic battery. As with other antiques, value is what the traffic will bear, and market prices vary enormously with condition, rarity, demand, and the seller's knowledge (The flea market axiom: If you don't know what it is, but it's small, it's $25; and if it's big, it's $100!). Click on the above link for measurements listed with width, height, and depth, in inches. Years of manufacture are approximate. Listings may be by description or manufacturer's name. Additions and corrections from readers are appreciated. REFERENCES to medical quackery over the years. This site is maintained by Bob Grove Auctions, P.O. Box 11, Brasstown, North Carolina, 28902. All contents copyrighted 1999. E-mail may be directed to bob@grove-ent.com. NOTE: This site is under continuing development for the free exchange of information regarding the history of medical quackery. No claim is made for absolute accuracy. The first stage, shown here, concentrates on quack medical apparatus. Stage two, patent medicines, is under development.